StyleXStyle (pronounced "Style by Style") has a beauty box that you can purchase every month called The Little Black Beauty Box, and this August, the theme is Jetsetter! These are supposed to contain sample products that are good travel buddies, beauty-wise, and comprise mostly skincare, from sunscreens to moisturizers, as well as other miscellaneous products, like perfume. StyleXStyle Little Black Beauty Box August: Jetsetter-friendly products! Let's take a look at what this month's Little Black Beauty Box has in store! Look at all those cute little miniature goodies! StyleXStyle Little Black Beauty Box: As you might guess, it's black! The first thing I noticed when I opened the box was this little flyer saying "it's all about you" - thanks for the reminder, it's good to know I'm going to get spoiled by all the beauty goodies inside! StyleXStyle Little Black Beauty Box August: It's all about you! This is what I have inside the box. A total of 9 skincare and beauty samples, along with a bunch of vouchers that you can use at TANGS. The skincare samples come from various brands, and there's a fairly good mix between Western brands and Asian brands. StyleXStyle Little Black Beauty Box August: An overview of all the products you get inside. Let's start with the Western brands. We have samples of Kiehl's Ultra Facial Cream, which I've previously reviewed and liked here (in fact my current tub is nearly gone), Benefit's Dream Screen, the brand's first-ever sunscreen offering with a SPF45 PA+++ rating, and is already now reputed for its invisible, weightless finish. There's also a small tub of Radical Skincare Anti-Aging Restorative Moisture Cream, which is touted to reduce wrinkles in 4 weeks. There's also three small sachets of Ioma's Cell Protector SPR50 + PA++, which is a sunscreen with anti-oxidant effects. Lastly, I also got a small vial of Ralph Lauren's Romance Perfume. That's not too bad - al of these are fairly upmarket brands, so although these are sample sizes they're useful for trying out something new and pricey, which would otherwise cost too much to invest in without knowing if it works for you or not. 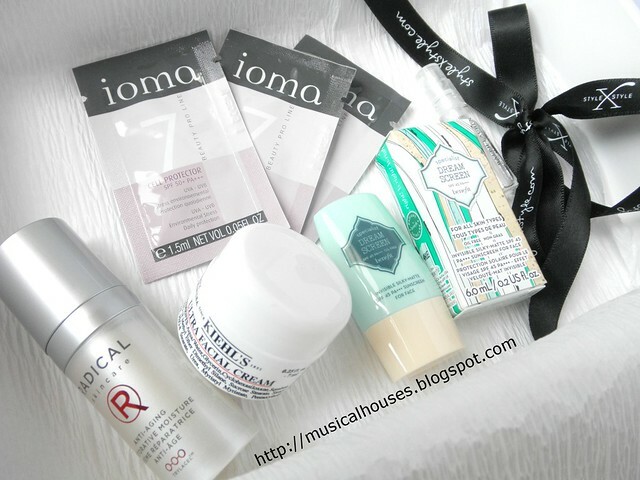 StyleXStyle Little Black Beauty Box: Western brands include Benefit, Radical Skincare, Ioma, Ralph Lauren, and Kiehl's. Now let's look at the Asian brands. 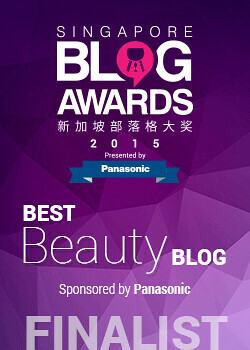 Once again, like the Western brands, the selection here is quite high-end, with brands like Sulwhasoo and Shiseido. For Sulwhasoo, you have the Evenfair Protecting Cushion, which is a BB cushion product. 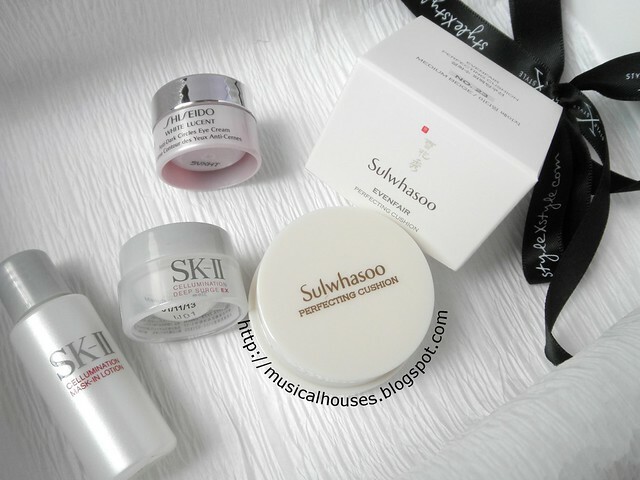 I've written about BB cushion products before (basically they are like BB creams, but in a compact and a nifty cushion that allows you to place a nice, thin layer of product on your face), but of course Sulwhasoo's one is a bit more upmarket. There are two SKII samples, both from SKII's Cellumination range, the Cellumination Mask-in Lotion, a lotion with the purported skincare benefits of a mask to reduce dark spokts, as well as the Cellumination Deep Surge, a moisturizer that is also geared towards whitening. There's also a small tub of the Shiseido White Lucent Anti-Dark Circle Eye Cream. 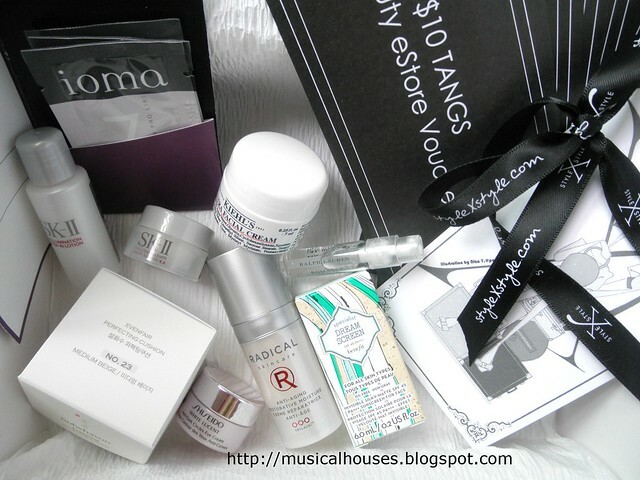 StyleXStyle Little Black Beauty Box August: Asian brands include Shiseido, SKII, and Sulwhasoo. Lastly, the extra treat that the Little Black Beauty Box contains - a bunch of coupons! 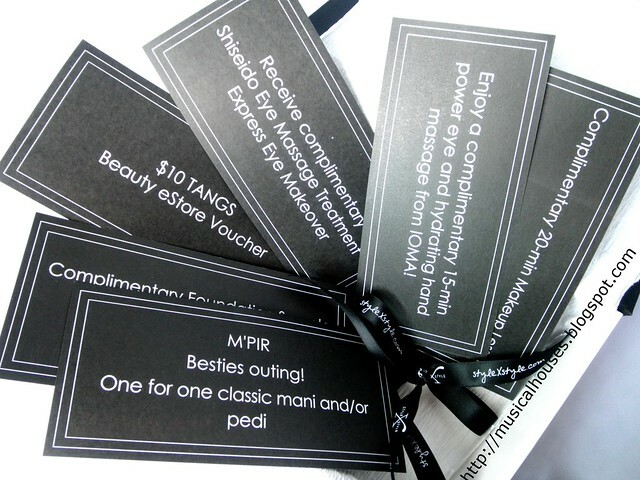 These are all redeemable in TANGS, and they encompass everything from free samples and mini-treatments, to a $10 voucher, to a one-for-one mani and/or pedi. If you do a lot of your shopping at TANGS, then this is probably a big plus for you. 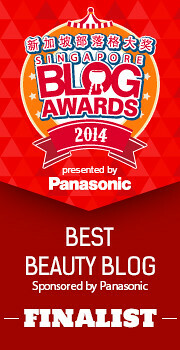 It's also definitely something a little extra on top of your average beauty box! 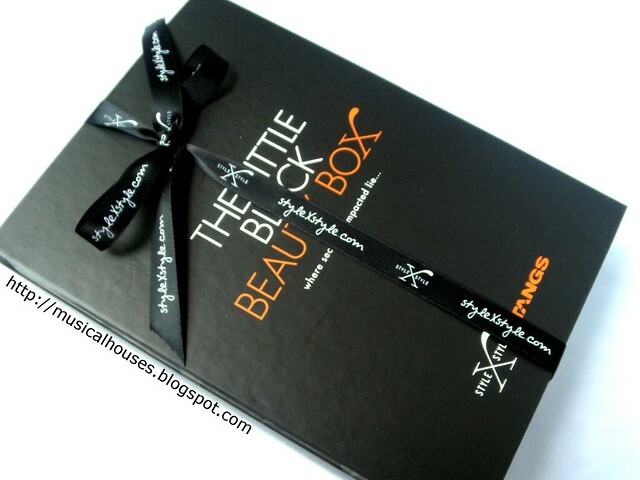 StyleXStyle Little Black Beauty Box August: The TANGS vouchers are an extra plus point! 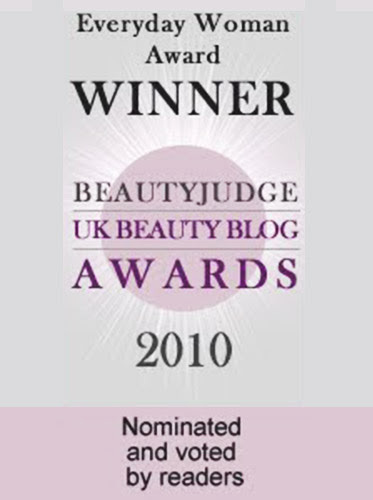 So, would I recommend the StyleXStyle's The Little Black Beauty Box? I think it depends on what you want out of your beauty box. Generally, most people I know like their beauty boxes to 1) have a variety of brands, 2) preferably have high-end brands, and3) include larger samples, or better still, a full-sized product in them. So for The Little Black Beauty Box, it does pretty well for both the first and second criteria, where there are a good variety of brands from the East and West, and where the brands are all high-end. Unfortunately, for those hoping that there are some full-sized products in there, then unfortunately all of these are sample-sized. Nevertheless, given the high-end brands and the price of full-sized products, the value of the box when totalled up is probably still pretty high! 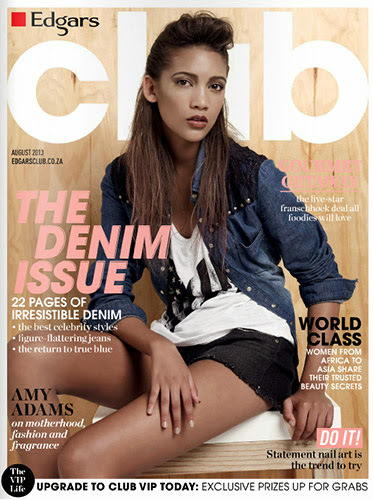 But on the plus side, the vouchers are also something extra from StyleXStyle. I'll be holding a giveaway for this box soon, so stay tuned for it! In the meantime if you want to find out more about the box, you can visit StyleXStyle's website here. Yeah, I would definitely prefer more full size products. Still, the products that are in the box look pretty good though, so I would not feel disappointed about a box like this.